Trading Triads explains the ‘Triads’ method, a system that enables simple market analysis, flagging accurate turning points as well as precise entry and exit points for trades. The book begins by introducing the reader to the Triads method and how it was developed, as well as explaining how it reflects the fundamental structure of the market. The author goes on to explain the oscillatory nature of markets, their structure and their key elements. The book explains why most indicators give false signals and explains how to avoid them. 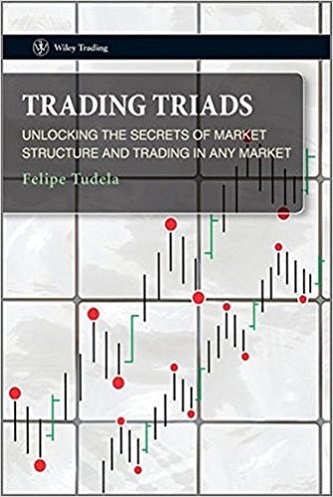 After exploring fundamental market structure, the book explains the Triads strategy. It covers precise entry and exit points as well as stop placement. Also it explains how to use Triads at the same time as other indicators to trade the markets most successfully – for example, how a simple moving average traded with the help of Triads becomes a powerful trading tool that avoids most false signals. It also shows how to trade an MACD, stochastic or any other indicator/method with the help of Triads. The purpose of these examples is to show how the Triads methodology improves significantly any trading method or trading tool. The book aims to explain to the reader a new trading method which can simplify analysis of the market, and provide a simple and extremely versatile strategy which can sit alongside the trader’s current range of tools to increase precision, and results, in their trading of the markets.